Pinch Valve is a Seat less & Glandless valve. The fluid passing through do not come in contact with either body or any other metal parts of the valve except the sleeve. Hence the body and other metal parts are almost not subjected to the corrosive action of the fluid. The flow through the valve is straight and full as that of a pipeline, when the valve is fully open. 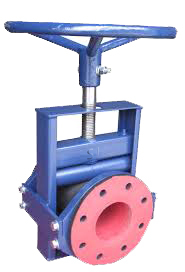 The valve is simple hand wheel operated of rising wheel type. Therefore the operation of the valve is just simple as other wheel operated valve. - SEAT LESS & GLANDLESS. - EASILY REPLACABLE ELASTOMERIC SLEEVE HAVE FOUR REINFORCED PULLING LUGS. - FLANGED ENDS & DRILLED TO DIN, ANSI, BS, IS OR AS PER REQUIREMENT. - EXCELLENT FOR ABRASIVE CORROSIVE APPLICATION. - END CONNECTION : AS PER DIN, ANSI, BS, IS & REQUIREMENT.